Is your toilet paper forest-friendly? With your help, more and more companies are selling forest-friendly tissue products. Despite this progress, when you're out buying tissues, toilet paper, paper towel or napkins its hard to tell which products are truly sustainable. 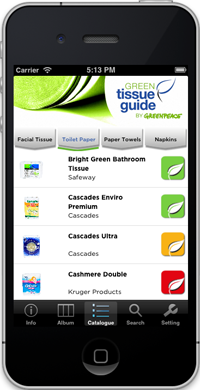 The green tissue guide app features a catalogue of over 150 tissue products like paper towels, toilet paper, tissues and napkins found in stores across Canada. At a glance, you can see whether your favourite brand is forest-friendly with the simple green, amber or red icon. With over 50 green rated products in the application, it's easier than you think to bring forest-friendly products into your home. The ability to protect endangered forests around the world and the animals, plants and people that depend on them is now in your hands. P.S Once you've downloaded the app, please rate it and share with your networks!